St. Patrick’s day is coming up which makes me think of my Granny. She was Irish and would always wear a big bunch of shamrock on her coat on St. Patrick’s day. The little version of me always wondered why she was wearing a bunch of parsley! Now I know better and not being able to buy shamrock, I have made my own. 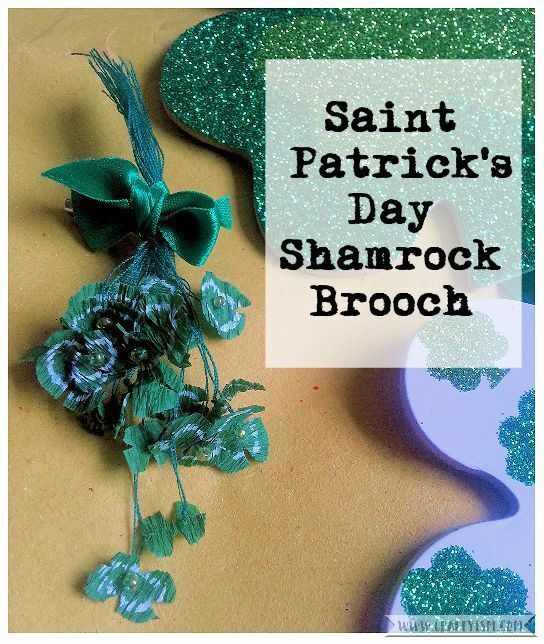 Celebrate the 17th March and use your paper crafting skills to make your own St. Patrick’s Day Shamrock Brooch. First you’ll need to cut some circles out of the crepe paper. I cut about 20 circles, some 1cm wide and some 5mm wide. Don’t worry about making them neat. 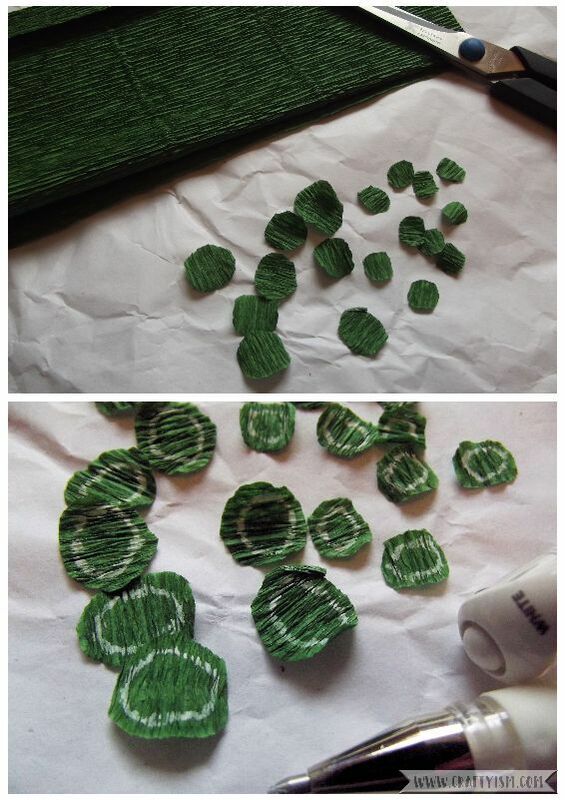 You can vary the size and number of circles depending on how bushy you want your shamrock brooch to be! Use the white gel pen to draw a circle slightly in from the edge, on all the crepe paper circles. As we have used crepe paper, the circles can be gently pulled and bent into shape. This is just to try and make them look less flat and more like realistic shamrock. 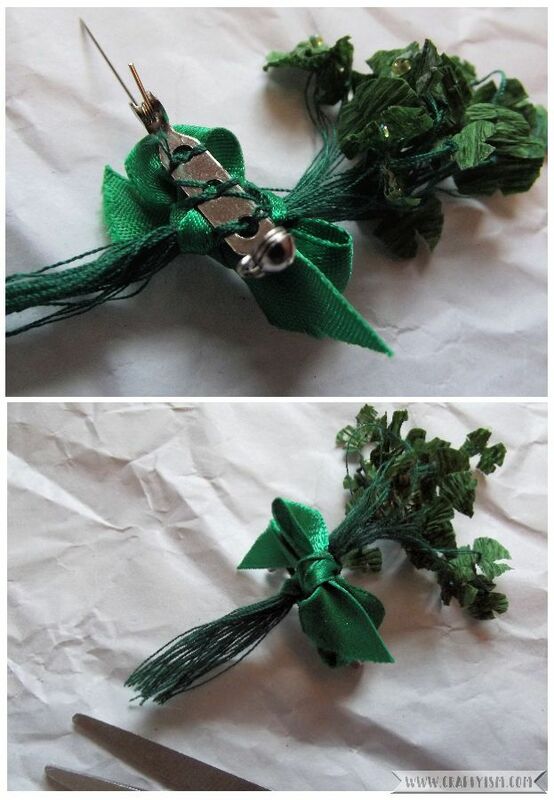 Take the green thread and cut a piece about 15cm long for each shamrock. Thread a seed bead onto the thread and move up to the middle. Fold the thread in half and thread both ends through a needle. 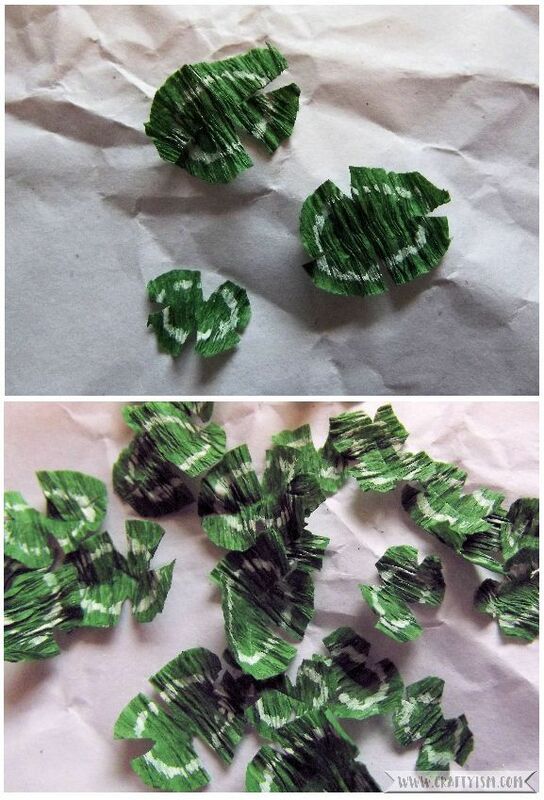 Take a crepe paper shamrock with the white circle facing up. Pass the needle through the centre of the shamrock. 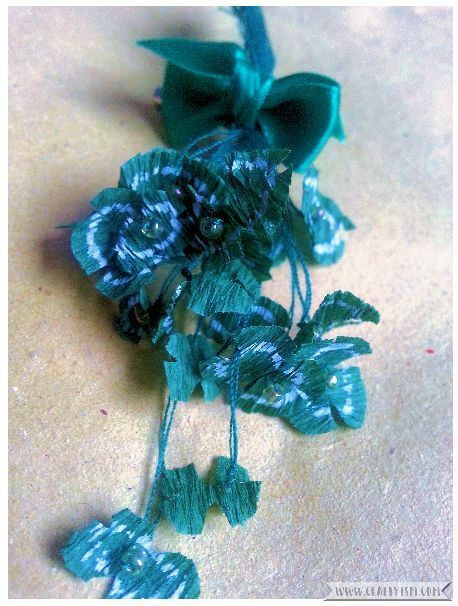 Continue to pull the needle through the crepe paper shamrock, until the bead lies flat in the centre. Turn the shamrock over and tie a knot in the thread, close to the paper, so that the stem is secure. Repeat with all the crepe paper shamrocks. Gather all the shamrock together and arrange into a nice looking bunch. Take another length of green thread and tie the bunch together about a third of the way down the stems. With the green ribbon, tie a little bow around the thread you have just tied. Make sure this bow will be big enough to cover the brooch back. 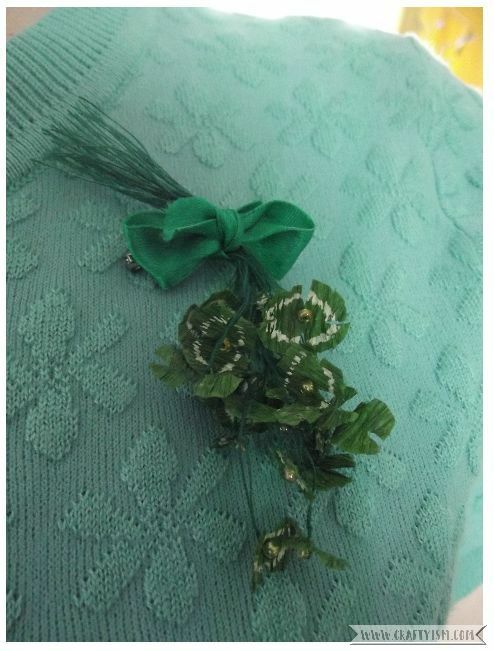 Lastly, turn the bow over and use the green thread to sew (or you can glue) the brooch back, to the back of the ribbon bow. Then trim the ends of the shamrock stems to neaten. Your St. Patrick’s Day Shamrock Brooch is now finished! I think it looks best to wear with the shamrocks pointing down, which is how my Granny used to wear hers! This is a bit of a fiddly make, but I am so pleased with the results! The brooch is very delicate but if it’s kept in its own special box, I think it could be worn for many St. Patrick’s Days to come. I’d love to see if you make and wear this St. Patrick’s Day Shamrock Brooch. Most of all, if you wear a bunch of real shamrock, I’d love to know where you get yours from!